Each of us, whether we are farmers or eaters, faces a choice between two food systems. One is an industrial system based on globalised corporate control, chemicals and poisons, GMOs, patent monopolies & fossil fuels which is contributing to 75% of the planets ecological destruction, wiping out the livelihoods of small farmers and family farms, and creating an epidemic of food style diseases. The second food system is based on strong vibrant local economies, ecological processes that rejuvenate our soil, biodiversity, water. It is based on the sun’s energy – not fossil fuels – from the growing to the cooking & processing of food. Organic chemical free & fossil fuels free food systems hold the promise of generating meaningful work while rejuvenating the Earth and addressing problems of health and climate chaos. 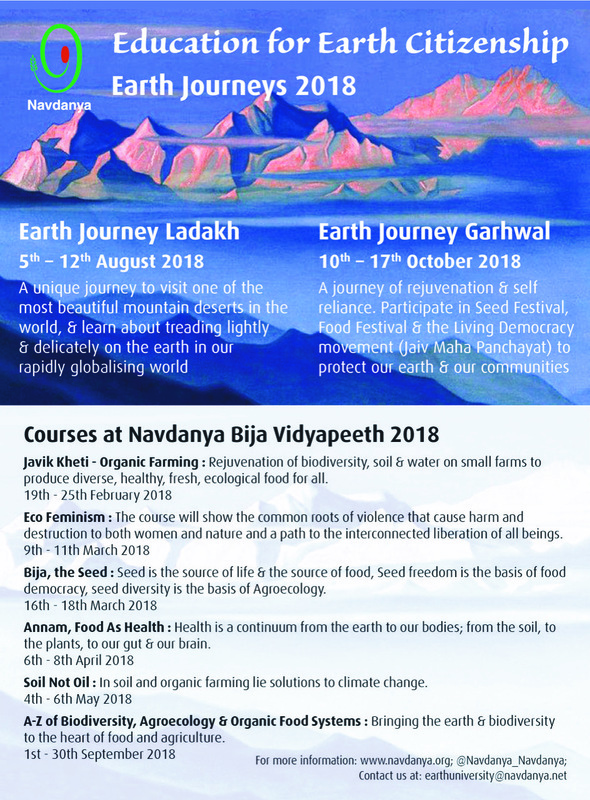 For 31 years Navdanya has been practicing biodiversity and community centred agroecological agriculture that enrich soils, enhances farmers incomes and increases nutrition and health. 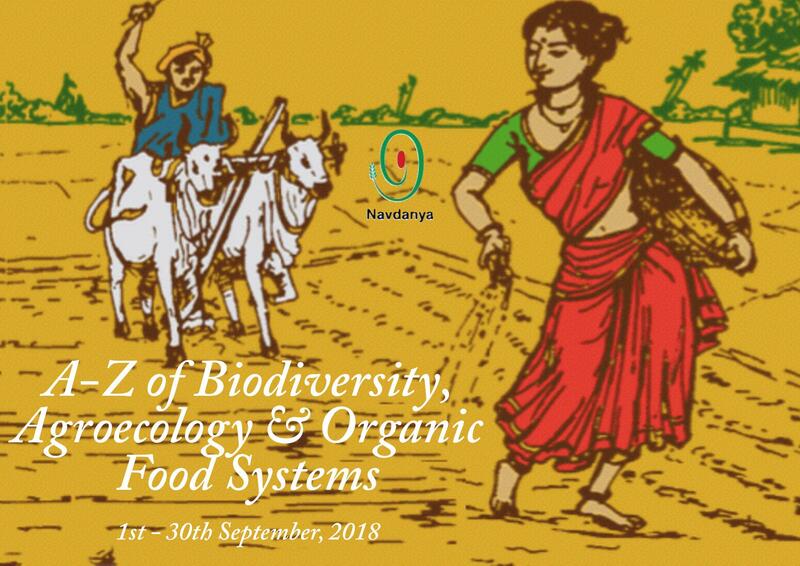 The course on A-Z of Agroecology, Biodiversity & Organic Food Systems is an opportunity to learn from the cutting edge ecological research combined with practical experience on Navdanya’s biodiversity farm. *Bhu- living soil, soil food web, ecological soil fertility renewal, diverse methods of composting, soil & climate. *Annapurna- living food economies – from extractive to circular systems, planning transitions from oil-based, poison based systems to living food systems & interaction with local community and farmers. 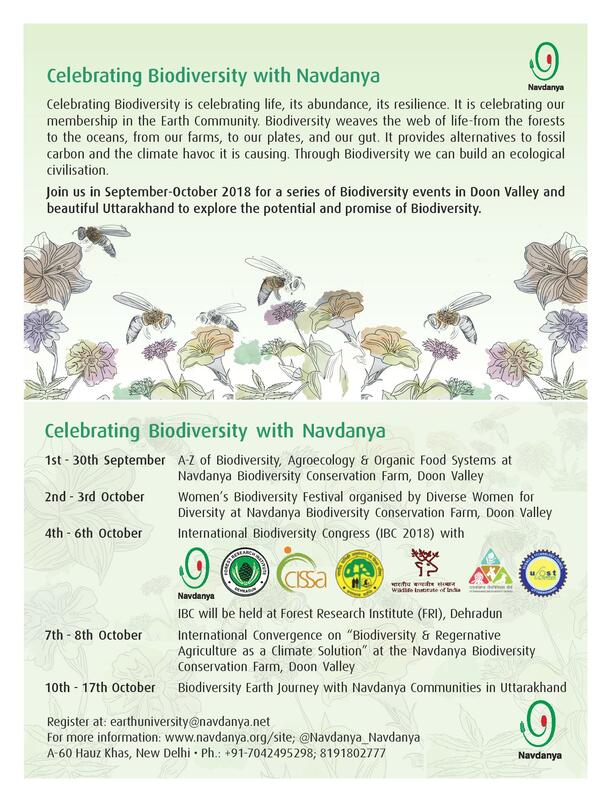 Join us in September-October 2018 for a series of Biodiversity events in Doon Valley and beautiful Uttarakhand to explore the potential and promise of Biodiversity. No Comments to "A-Z of Agroecology, Biodiversity & Organic Food Systems"